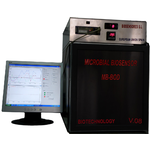 Biosensores, S.L., is a company dedicated mainly to the development and application of on-line analysis technologies, has obtained microbial biosensors for the automatic quantification of key parameters of water quality. Specifically these parameters are: Biochemical Oxygen Demand (BOD measurement of organic pollution of water), Integral Toxicity of Water and quantification of aerobial microorganisms in fluids (Microbial-Counter). 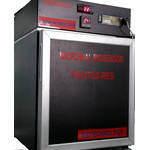 The BOD and Politox-Res microbiosensors uses an innovative system that provides a constant supply of a standard microorganism suspension. This stock supply of microorganism is characteristically stable in composition, activity and concentration. Thus, the reliance on heterogeneous and ever-changing microbial communities, like those present in activated sludge, is eliminated. Using the principle of respirometry, the BOD microbiosensor measures the amount of oxygen required by a constant volume of the standard microbial suspension to oxidise the organic material present within a sample of waste water. The duration of this increased respiration depends on the complexity of the sample and takes between 15-20 mins. The Politox-Res microbiosensor measures the water integral toxicity by a similar process. Microbial-Counter biosensor, is a device which analyses the concentration of aerobial microorganism in water sample in 15 minutes automatically in comparison with the other procedures of analysis which are carried out in labs in 24-48h. Its analytical strategy is based on the capacity of generation of oxygen by those aerobial microorganisms during the analytical process. Also we are developing affinity biosensors. We are looking for Partner, research colaborations, Distribution, etc. We would like find customers with needs for automatic analysis (in real time and with a low cost) to offer them a solution in these problems. Also we are looking partners for research, distribution of our products, or financial partners. Biosensores is looking for project opportunities as well, at any level and with any institution or company. Automated device for on-line biodegradable organic matter (BOD) monitoring for drinking, wastewater and industrial water in 30 minutes. Over 90,000 hours of uninterrupted operation in real environment and facilities, optimizing its good work outdoors and supporting the robustness of this device. Patented and supported by several Spanish organizations (Spanish Ministry of Public Works, CSIC and Government of Andalucía Region) and verified by EU environmental and science bodies (PROMOTE-ETV, BIOSET, Concerted Action). 	High robustness and performance due to the equipment uses specific and new microorganisms in each analysis, allowing a wide application in industries, rivers and fish farms. 	Double inner calibration in each analytical cycle, using pattern samples. 	Frequency of analysis is fully programmable by the user. It can carry out from 1 to 20 tests per day. 	The BIOSENSORES´s own-designed software allows emitting the collected data to any remote device: mobile phone, control panel, PDA, etc. 	The equipment can capture warning samples that exceed certain limits for its later detailed analysis in a laboratory. Companies with needs to detect biodegradable organic materia, with low cost, automatic and in real time. Automated real-time monitoring of the overall toxicity presented in water in one hour time. •	Frequency of analysis is fully programmable by the user. It can carry out from 1 to 20 tests per day. •	The BIOSENSORES´s own-designed software allows emitting the collected data to any remote device: mobile phone, control panel, PDA, etc. •	The equipment can capture warning samples that exceed certain limits for its later detailed analysis in a laboratory. •	Thanks to its automation, the device is totally self-cleaning. POLYTOX-RES is a powerful surveillance tool for any type of water pollution, either by organic or inorganic, with particular application in wastewater treatment plants, industry and environmental protection areas. 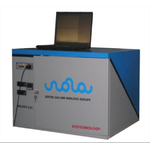 Automated device for on-line monitoring of the concentration of total microorganisms in liquid samples in 15 minutes. •	Excellent correlation with the classical analysis in laboratory "Petri dish"
MICROBIAL COUNTER is a powerful and essential tool for sewage treatment plants, industries (pharmaceutical, chemical, etc. ), drinking water and aquaculture in their daily processes. Especially, it is designed to measure aerobial microorganisms’ concentration fast and cheaply in food industry (beverage, dairy, etc. ), water for different uses. Also, it can be used for microbial quantification in hydraulic circuits, in order, for example, to prevent Legionella contamination.